I was jus wonderin if any of yall had heard of these or if anybody used them. I stumbled across them and theyre pretty cool. My dad climbed with spikes years ago then they started makin climbin stands so he got one of those( a loooong time ago). I dont have one yet but it seems like these might go well with a guidos web or a tree saddle,just an idea . What are yalls thoughts? Those look to be painful on the ankles. I know regular aluminum spurs are pricey but they would be my choice. Also keep in mind spurs are illegal on most public land areas. A buddy of mine has an old set of climbing spikes and he says they are neet, but way too dangerous compared to all the climbing aids we have available to us these days. I gave it some real thought. And asked many questions about them. From what I have heard they don't work on all trees, there pricey, and can be dangerous. So with all the other stuff we have out there I am just going to use the one stik method I do believe. But you form your own opinion. 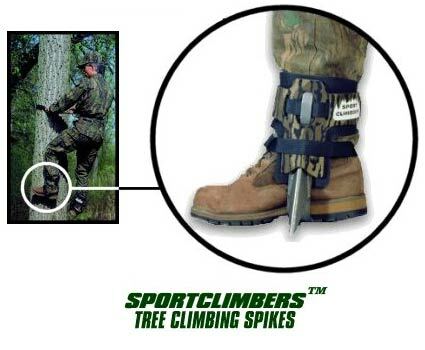 Spurs are the fastest way to climb a tree & one of the lightest. With practice it's a pretty good method. As I said early I would good with regular tree spurs & not the sport climbers. Couple of downfalls spurs are pricey & illegal on some public land. I start lineman school september 4th, ima check into alabamas rule book i think screw in steps and drilling are illegal here, not to sure about tha spurs though, id like to usem if i could but i agree the tunnel strap is to short, it does looks uncomfortable. Thanks for tha input fellers its much appreciated. I would bet that they would be fine(I would still check though). The reason that screw in steps and things of that sort are illegal on most public lands is because they tend to grow into the tree and then they become a safety concern for loggers. Chainsaw+tree step=potential trip to the hospital. If nothing else it is costly to replace equipment damaged when it hits a tree step or anything else grown into the tree over time.